Meet to requirement of CCNP Wireless certification, DumpsBase updated CCNP Wireless WITSHOOT 300-370 practice questions. New version of 300-370 exam questions contains 101 questions and answers, which are real and valid to ensure your success in Troubleshooting Cisco Wireless Enterprise Networks exam. A client reports being unable to log into the wireless network. According to the output, which network information should be verified? 2. Refer to the exhibit. A client reports being unable to log into the wireless network, which uses PEAPv2. A. The AP has the incorrect RADIUS server address. B. There is a problem with the client supplicant. D. The authentication server is misconfigured on the controller. E. The EAP client timeout value should be increased. 3. An engineer must open a support case with Cisco TAC. 4. While reviewing CleanAir data in Cisco Prime Infrastructure, an engineer notices that a wideband jammer is not sending its Interferer Security Trap correctly. The engineer determines that the default severity level has been changed. Which value does the engineer select to reset the severity level to its factory setting? 5. An engineer is using various techniques to discover and isolate rogues on the network. For which technique must the engineer consider legal ramifications? 6. 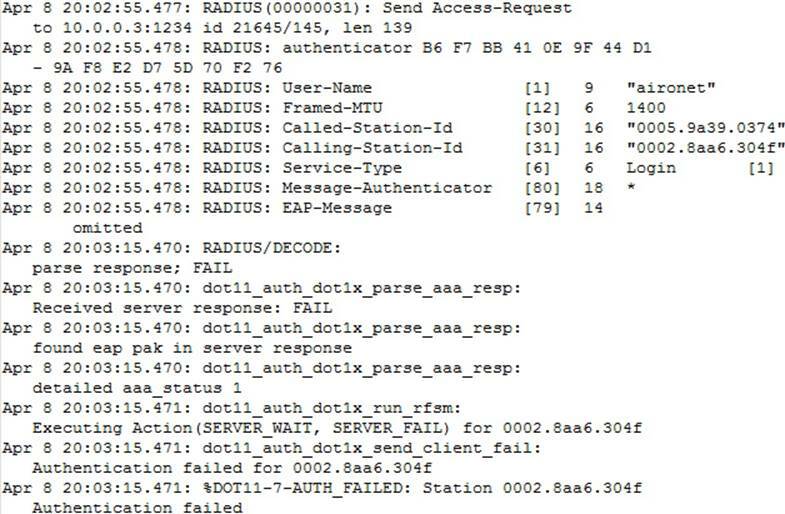 Which Cisco WLC debug command allows you to determine if the certificate process is failing in the CAPWAP messages? 7. Which channel width is the maximum that can be obtained by bonding two 802.11ac subchannels according to US regulations? 8. Scenario The big Engineering IT team has been in the lab to test some new features that the existing network does not support. The AP Groups, AP Failover, and Local Web Auth features are having problems. In this test environment, the controllers support the only Composite Structural Engineering and Aerodynamic Engineering groups. All SSIDs must omit the department name. Refer to the exhibit. The diagram is the floor plan for the Big Engineering office and the distribution of the departments. These tables show how the controllers have been configured. You review the configuration of the test network controller. A. Change the High Availability Primary Controller Management Interfaces IP address for access point 3700-CSE-A. C. Add the Local Net User names and passwords. D. Change the Layer2 security to none and Layer3 Security to Web Policy for the CSE-Contractors WLAN. E. Remove the current WLAN from the CSE-WLAN AP Group and add all three of the WLANs configured in the CSE-2504A. 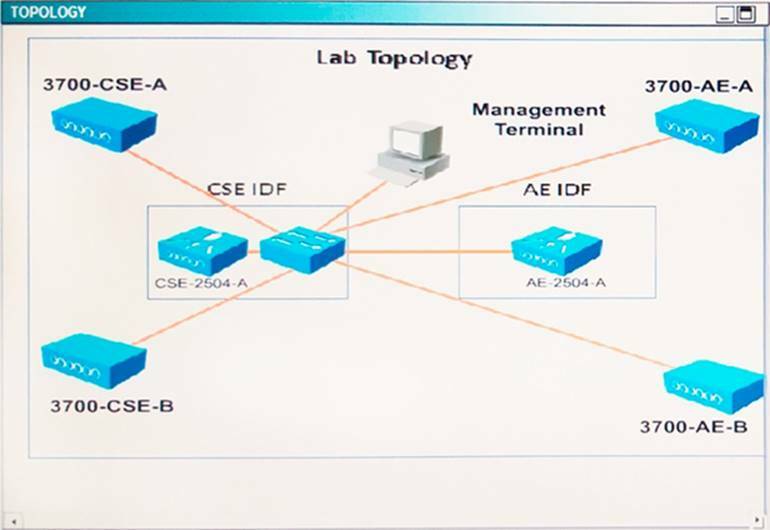 G. Change the High Availability Secondary Controller management Interface IP address for access point 3700-CSE-B. H. Change the High Availability Primary Controller Name for access point 3700-CSE-B. The AP is unable to join the controller. C. AP model is not compatible with the controller code version. D. The AP is not configured in the controller auth-list of acceptable APs. 11. Refer to the exhibit. Employees upgraded company issued iOS devices, which are configured to authenticate to the network using WPA2-Enterprise 802.1x with LEAP. As a result, the devices are no longer able to authenticate. Which action must the engineer do to resolve the issue? C. Reset network settings on the devices. 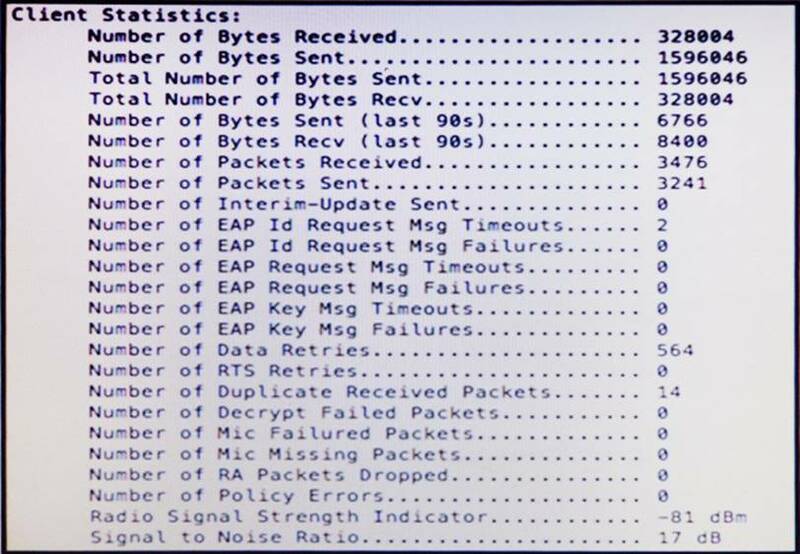 An engineer is troubleshooting non-802.11 interference and observes this output. Which type of interference signatures can be identified? Which statement about the join process of the access point is true? 14. Refer to the exhibit. A new wireless deployment with high AP density is experiencing high latency and connectivity issues on the 2.4 GHz band, despite an initial site survey done by a certified partner. Which option is the most impactful change a wireless consultant recommends? 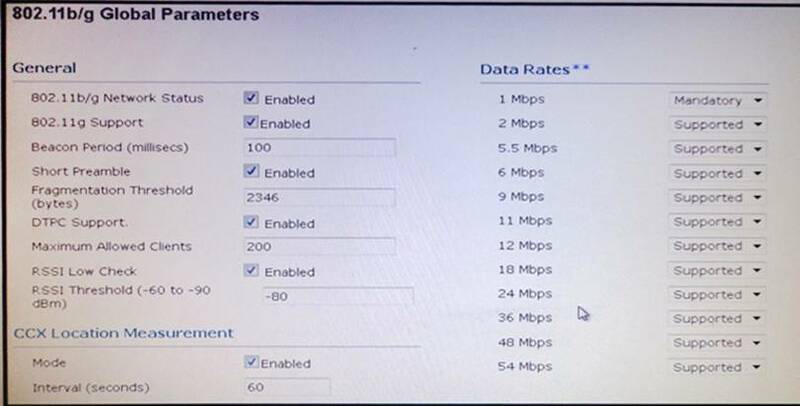 C. Disable lower data rates such as 1 Mbps and 2 Mbps. E. Disable 802.11g support to reduce interference. 15. A wireless user is experiencing connectivity issues with their Mac OS laptop. If the Mac is exhibiting the behavior of a “sticky client,” how can the tech verify which AP the user is currently connected to? 16. You have successfully configured HA and SSO using two Cisco 5508 Wireless LAN Controllers. You are able to access the Active Primary WLC but are unable to access the Secondary Standby WLC. 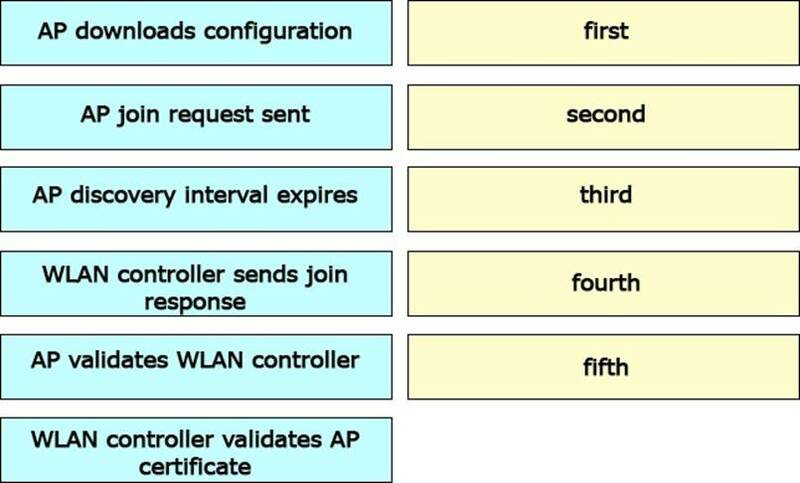 Drag and drop the Layer 3 WLAN controller mutual authentication join process events on the left into the order in which they occur on the right. Not all options are used. 18. An engineer has configured 802.1x for the network and all but one of the APs are passing authentication. Which configuration is causing the failure? 19. An engineer is troubleshooting AP join issues on a wireless infrastructure. While gathering debugs, the engineer notices that one of the commands may generate an excessive amount of data on the console. Which command causes this to occur? 20. Which ports require unrestricted port access for CleanAir RF spectrum analysis between the AP and Cisco Spectrum Expert? 21. 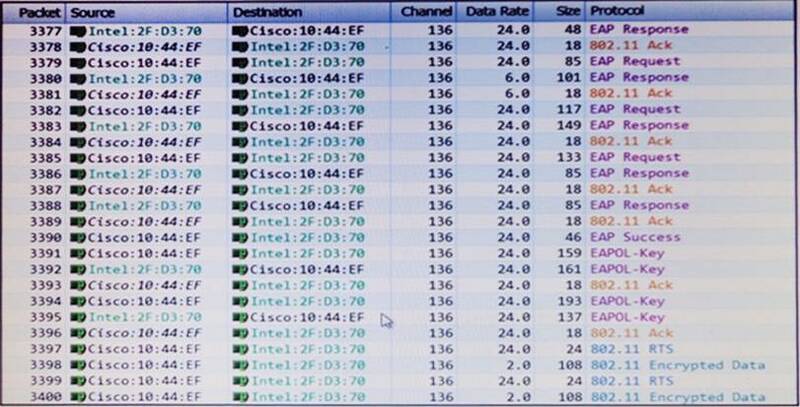 A network engineer is troubleshooting why EAP authentication with a client is failing. 22. Refer to the exhibit. Which type of interference signatures can the engineer identify? 23. Refer to the exhibit. An engineer is troubleshooting access point placement issues and suspects that poor placement is causing connectivity issues. When running the show client detail <mac> command, the engineer notices this output. 24. An AP will be deployed to an area where DHCP Option 43 is unavailable and the WLAN engineer is unable to have DNS modifications made to support this AP. C. Add MAC address CC93.1981.0035 to the Security:AAA:MAC Filtering tab. 26. Which feature should a network engineer enable within a mixed-client network to ensure that the legacy client operates at the best possible rates? 27. A WLAN was installed at a high AP density. DTPC is lowering the transmit power of many APs too low. Which change in the DTPC transmit power threshold must be made to allow APs to globally increase AP transmit power by 3dBm? 28. Which visual cue accurately describes a characteristic of the zone of impact displayed in Cisco Prime Infrastructure? A. The closer the circle is to blue, the more localized the impact is.